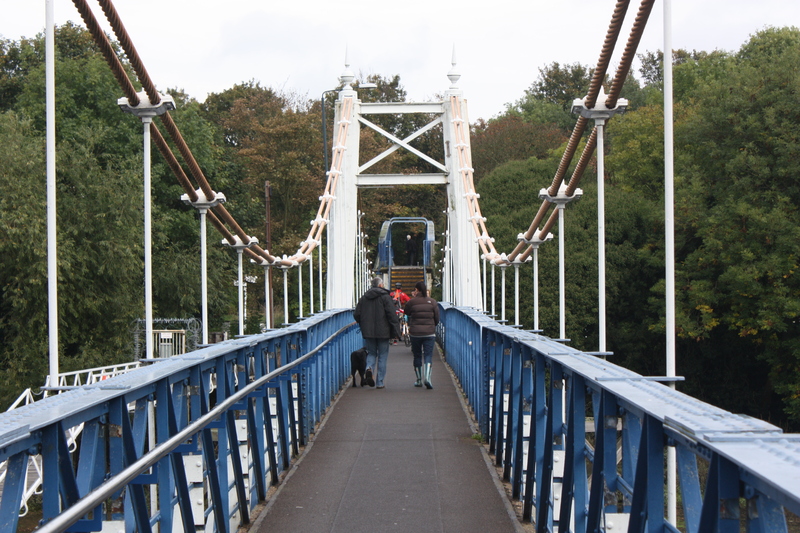 I crossed the bridge from Richmond to St. Margarets. 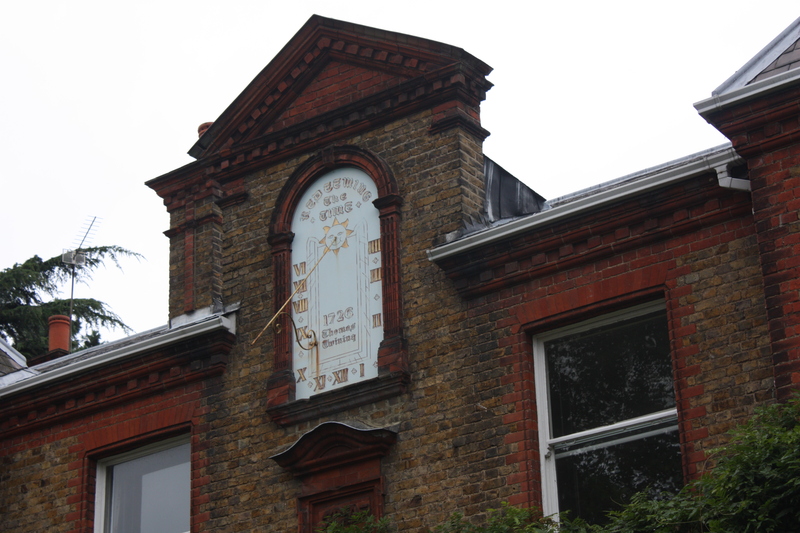 Set back a little from the river at Twickenham is Dial House, so called because of the colourful sundial on its facade. The sundial bears the inscription “Redeeming the time” – a biblical quote which in the book is followed by something about days being evil. It also states “1726 Thomas Twining”, he being the founder of the famous tea company. It is a very grand house; there must have been plenty of money in selling tea back in the day. 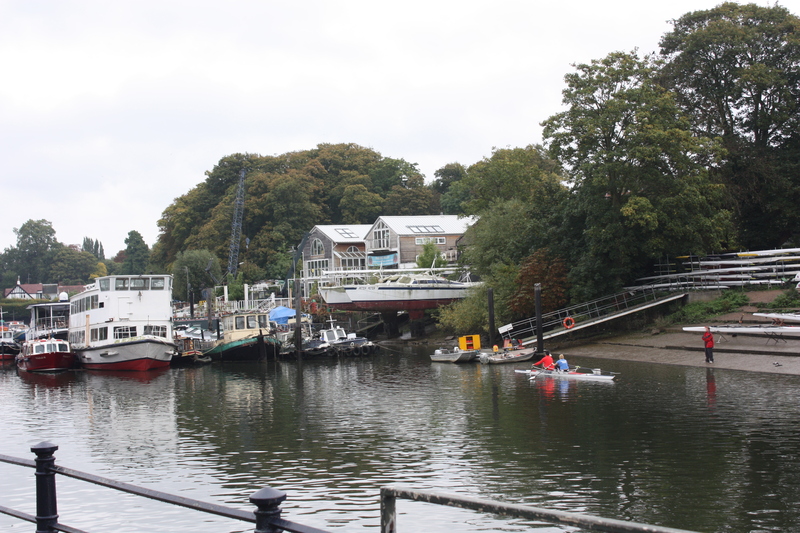 The main reason for walking this section on the West side of the river was that I wanted to see Eel Pie Island at close quarters. The island and in particular the Eel Pie Island Hotel (long since demolished) were at the centre of art/jazz/beatnik/rock’n’roll in the 50’s and 60’s. It played host to such luminaries as the Rolling Stones, Pink Floyd, David Bowie, Jeff Beck, George Melly, The Who and so on and so on. You name it. Looking at it now it’s another Thames island with houses on it. But back in the day it was a very scruffy place with amazing parties. Unfortunately the decision to walk the west bank meant that I had a mile or two of walking parallel to, but about 20 yards away from, the river as I approached Teddington. I crossed the footbridge here to get back onto the riverside. On the Teddington side of the river there is a pub with a sign that amused me. 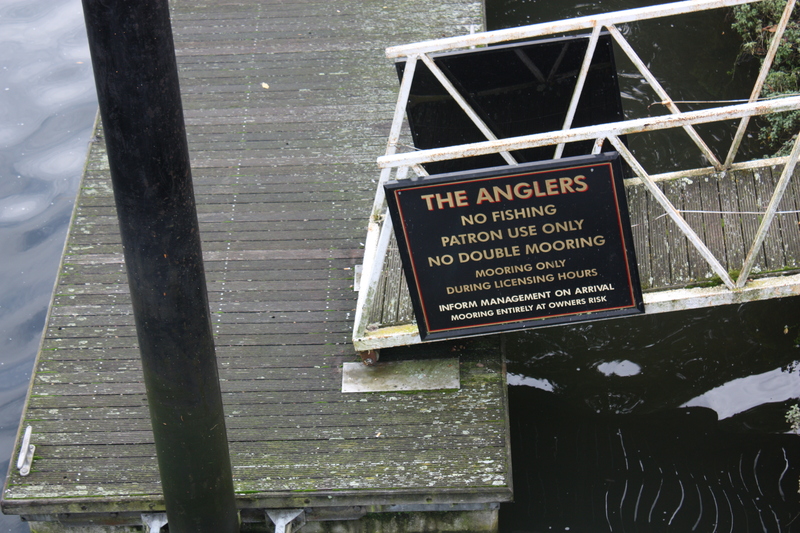 The pub is called “The Anglers” and the sign read “No Fishing”. 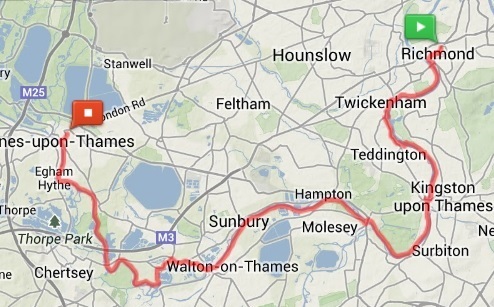 Teddington Lock marks the limit of the tidal Thames, so I am assuming that I have said goodbye to the mudflats that characterised the early miles of this walk. 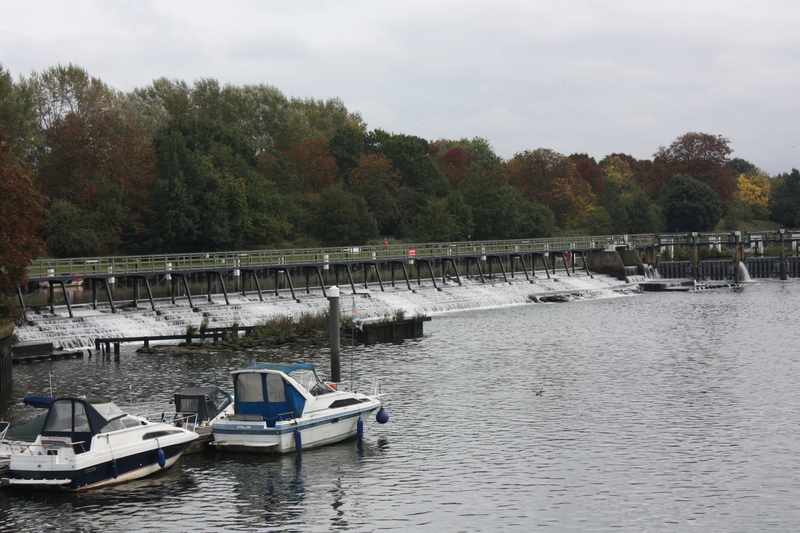 More importantly, Teddington Lock was also the location for the classic Monty Python “Fish Slapping Dance” sketch. Look it up on Youtube. 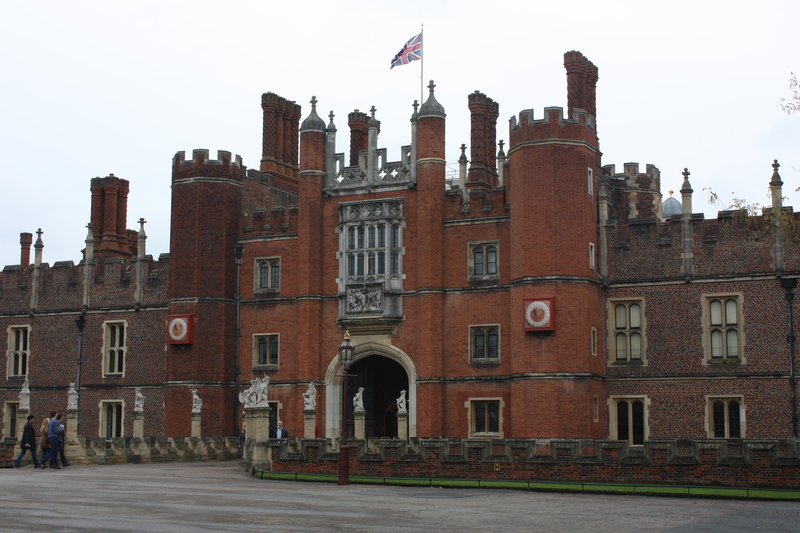 Heading south towards Kingston, a sign told me I was 2 miles from Hampton Court. Half a mile further on I crossed Kingston Bridge to find another sign telling me that I was now 3 miles from Hampton Court. I was pretty sure I was going in the right direction so maybe I was hallucinating. Certainly I started seeing green parakeets flying around. That coffee must have been stronger than I thought. 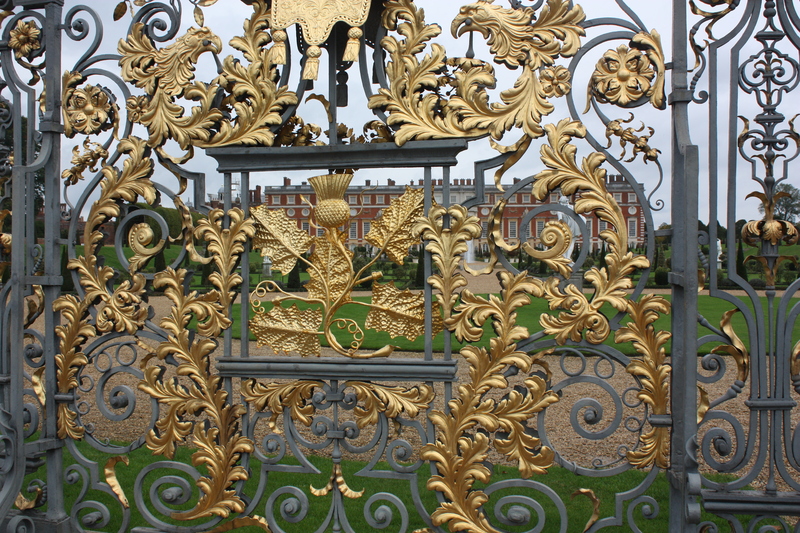 At Hampton Court a signpost helpfully reminded me that there were still 147 miles to go to the source of the Thames. As I crossed the river once more it started raining. It rained hard. It rained so hard that ducks were sheltering under trees. I’m not joking. Remember I said I couldn’t figure out how to work my rucksack? Of course now I couldn’t find the compartment holding its waterproof cover. But at least I had my own personal waterproof cover. Happily a couple of miles further on the rain stopped and – gently steaming – I slowly dried out. They’ve put a new bridge across the river at Walton. 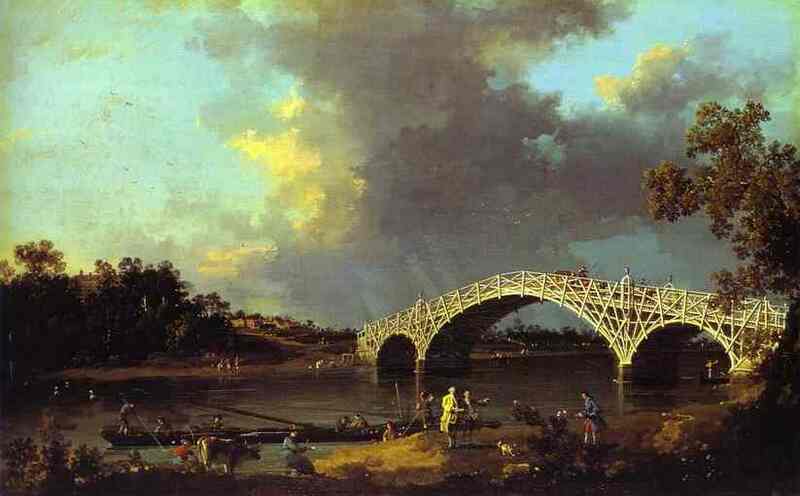 It’s not as pretty as the original bridge as painted by Canaletto (I mean he did a painting of the bridge, not that he got up a ladder and painted the actual bridge) but probably more practical for traffic-flow. As I walked across this modern technical masterpiece, the clouds parted and the sun came out. Having first received a soaking, I now felt in danger of suburn. The bells at Shepperton church rang out for a wedding. The bride was waiting outside the church, about to go in. She looked stunning. As I pondered her captivating beauty, she turned and looked directly at me. Then she beamed a ten megawatt smile that nearly knocked me off my feet, and waved. In that instant I decided that I would stride right over there and tell her that she should not go ahead with this ridiculous charade of a marriage, but instead should come to Staines with me. Fortunately before I did so I looked back over my shoulder and saw a smiling woman carrying a dog waving back at the bride. Apparently I just got caught in the smile crossfire. Ah well, back to reality, I turned left past the water works and back to the river. I am getting used to seeing some amazing houses alongside the river. Many of them are huge and beautiful, and I came across a whole row of them as I approached Staines. One of them was called “The Tiny House”. I hope it was so-named with heavy irony because the garden shed was way bigger than my house. My arrival in Staines was perfectly timed as I got back to the car just as the heavens opened. Dave Gilmour’s boat is normally moored up-stream of the bridge near Hampton Court. You’ve done an impromptu Pink Floyd tour! Yep – good point. I’ve already been to Battersea Power Station, site of the Animals album cover (apologies to anyone under 30, but I’m not going to explain what an album cover is) and I believe Rick Wright had a boat at Eel Pie Island. My next project will be a walk to the Dark Side of the Moon.